Watchable threequel that's slightly better than the second film thanks to decent comic performances from Jason Lee and David Cross, though it still manages to waste the talents of the voice actors involved and the songs are even more irritating this time round. Directed by Mike Mitchell, Alvin and the Chipmunks: Chipwrecked stars Jason Lee as chipmunk manager-slash-guardian Dave, who embarks on a luxury cruise with Alvin (Justin Long), the Chipmunks (Matthew Gray Gubler as brainy Simon, Jesse McCartney as dozy Theodore) and the Chipettes (Amy Poehler as Brittany, Anna Faris as brainy Jeanette and Christina Applegate as dozy Eleanor), only for all six singing rodent sensations to become separated from the ship and wind up stranded on a desert island after a stunt with a kite goes badly wrong. After a similar accident with a hang-glider, Dave and his disgraced ex-record executive cousin Ian (David Cross) - who's working on board the ship dressed as a pelican - set off in pursuit and wash up on a different part of the island. Meanwhile, the chipmunks have their hands full with two different problems: first they encounter a crazy woman (Jenny Slate) living on the island with a collection of sport-based balls (Cast Away-style) and second, Simon has a complete personality change after a spider bite and starts behaving like a dashing Frenchman. As with the previous films, the chipmunks are impressively animated and interact well with the real-life actors. The threequel also benefits from the re-instatement of Jason Lee (side-lined in the sequel with a leg injury), who has strong comic chemistry with David Cross (very funny) and manages to make Dave's relationship with the chipmunks both believeable (in that he genuinely cares for them as individuals) and surprisingly touching. The cast are fine, but once again, the chipmunk-ification of their voices mean that the talents of Poehler, Faris and Applegate are effectively wasted because they all sound the same and it's often hard to hear what they're saying. Similarly, the songs are even more irritating this time round and are often reduced to short bursts of recognisable modern hits (notably Lady Gaga's Bad Romance and Willow Smith's Whip My Hair) in pursuit of cheap gags and, presumably, soundtrack sales. 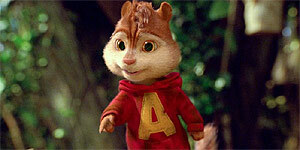 Young fans of the first two films are unlikely be disappointed by Alvin and the Chipmunks: Chipwrecked and the presence of Lee and Cross means that there are at least a handful of gags aimed at adults, but the songs are disappointing and the script completely wastes the talents of Poehler, Faris and Applegate. Not recommended for those with low chipmunk tolerance.